I'm the kind of person who doesn't buy stuff that's made to look like it's already worn in. Other people may pay big money for that stuff, but why pay for a pair of ruined jeans or boots when I could tear or scuff them myself? Nice stuff looks good after it's lightly tarnished, though. It's more characterful somehow. Take some sedans that are between 20 and 25 years old, like the old European kind. All of that stuff was pretty pricey when new, but they were generally made to be used hard and many owners did. And these cars wear their dings and faded paint well. Which is why I've brought an Audi and a Peugeot together today. There's a lot wrong with these cars, but they make up for it with character! The original Audi S4 is probably well-known around these parts, but it's an extremely cult car in the grand scheme of cardom. A shame, because had it come along in the 1980s when Audi was doing well there might be many more to choose from. But here's a hard-charging 1992 S4 in gleaming "original lipstick red" paint, according to the seller. 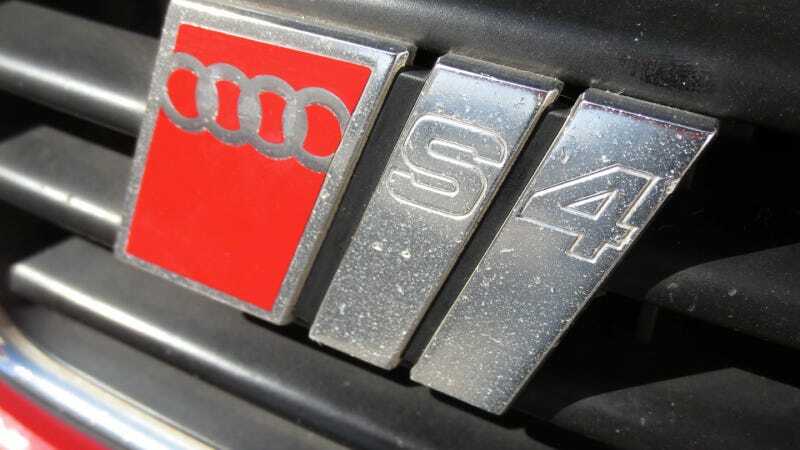 Technically, the S4 of this era is really the S6's predecessor, so it's a large and fast all-weather machine and this one has 240,000 miles worth of battle scars. Awesome. The more time you look at old Audis, the more you respect how stylish and classy they look. The S4 hides its age with timeless elegance and an interior that only looks dated because of its simplicity. OK, this car also lacks a radio, but don't add a crap-looking aftermarket sat nav. Keep it refined, future owner. In classic old Audi form, this is a turbocharged 2.2-liter five-cylinder, good for a stout 227 horses when new and mated to a five-speed manual and powering all four wheels because old quattro. I totally get why this S4 has 240,000 miles. I'd drive the hell out of this machine in all kinds of conditions. I'm even more amazed it's lasted this long. It certainly wasn't babied, but it was well loved. And it's definitely an oddball kind of old car, but not as much as its rival here. This is a 1988 Peugeot 505 V6 with 129,000 miles, reportedly. This is an old, durable car. Apparently, there's not much to say in the ad, either. Up for sale french car few left in usa good running car the paint is peeling off but runs and drives excellent low reserve. Well, that's short and sweet. I've long been a supporter of 505 oddities like the turbo wagon with 8 seats, but any 505 is an oddity these days that I'll take what I can get. Unlike the Audi, the Peugeot looks 25 years old. It's clearly a product of the late '70s/early '80s and looks like a relic. A good looking relic, though. And peeling paint is a good look for it, actually. The V6 was not a big seller in the 505's typical markets, but Peugeot really wanted to sell its cars in the U.S. The 2.8-liter PRV V6 only made 170 horses and this is no lightweight, so it isn't the speed demon I wish it was. Still, doesn't that back seat look inviting? And it's rear-wheel drive, like an old Volvo. And those are fun to drive quickly. There's a whole generation out there that has never seen a new Peugeot in the U.S. It's a shame and it's a shame the 505 isn't remembered here like all of its competitors. Such a solid design has stood the test of time and even though many of the examples are tattered and broken now, they wear it really well. I'd love to own a distressed 505 Wagon at some point. But for me today, it's the S4. Sure, it's a high-miler. But after a hard life, it still looks sharp and has a turbo and a manual. I'd go for it, even if it'd quickly make me poor and crazy.